As the most cutting-edge event technology available, virtual reality is quickly gaining a reputation for creating fun, engaging, and completely unique guest experiences. If you want to position yourself as a tech-forward brand while giving your guests an experience they will never forget, virtual reality is your best option. However, because the technology itself is so new, it can be difficult to decide what type of virtual reality set up is right for you and your event. Don’t worry, we can help! As VR experts, we understand that you have many virtual reality options, and that part of our job is helping you know as much as possible about your choices. Whether you want to rent a virtual reality experience that fills the entire room or want to let multiple guests experience VR around a single table, we can help you make it happen. Additionally, if your looking to shoot your own 360˚ video, or want help creating a completely new experience focused on your brand, we can point you in the right direction. This guide will give you a quick rundown of all of the great options to consider as you plan your next event. Of course, if you would like to speak to one of our experts, we’re always happy to hop on the phone and answer your questions (link.) We’ve separated this guide by category, so if you already know what you’re looking for, you can use the index below to skip to the correct section. Room Scale Virtual Reality is the most immersive VR option on the market. In room scale VR, your guests are able to move around in virtual space while their head and hand motions are tracked in order to create the feeling that they are actually there. Anything you can imagine can be made possible through this type of VR activation. Image standing on Mt. Everest and using your hands to climb a virtual reality ladder while looking down at giant, icy cavern, or testing your zombie defense skills in a post-apocalyptic VR world. We can safely say that room scale virtual reality can be used to create a completely unforgettable guest experience at your next event. Below, we’ve included a few different room scale options for you to consider as you think through your VR rental. When considering virtual reality equipment rentals, the HTC Vive is a great place to start. Known for being incredibly immersive, this headset has the capability to deliver mind-blowing VR experiences. This is made possible through it’s wide field of view along with a very high image resolution, which combine to place you seamlessly inside your new virtual world. However, the Vive isn’t only technologically advanced, it’s also very comfortable with a lightweight design and adjustable head straps. To read more about this headset, check out our in-depth HTC Vive equipment page. In order to create the perfect HTC Vive experience, you'll want to make sure you have (at minimum) these basic equipment needs: one HTC Vive headset, two motion-tracked Vive controllers, Two Vive sensors, and a computer/laptop capable of running VR experiences. Additionally, we suggest including an external monitor so that your guests can see the VR experience even if they aren't wearing the headset. The total area of your event space is also important when considering your VR equipment needs. In order to get the full room scale VR experience, you should have an available area of about 8ft x 8ft. If that's not possible, we do have access to some experiences playable in a 6ft x 6ft space. One of the most popular virtual reality headsets available, the Oculus Rift is able to deliver an awesome VR experience. Backed by Facebook, the Rift has already proven to be an extremely capable VR headset, and is poised to get even better. Using “positional trackers,” the Rift follows your movement in VR space and ensures the smoothest experience possible. Also, with some of the best controllers of any VR system, it offers you an unparalleled ability to interact with virtual objects. If you’re interested in the Oculus Rift, check out our complete overview of the system. When renting the Oculus Rift, here is what you should look for: An Oculus Rift headset, two Oculus “Touch” controllers, at least one “positional tracker,” and a laptop or computer capable of running virtual reality experiences. You will also need one external monitor so that guests not wearing the VR headset are able to see the experience. This is a great way to drive traffic while making sure everyone can be involved. In order to get the full room scale VR experience, you should have an available area of about 8ft x 8ft. If that's not possible, we do have access to some experiences playable in a 6ft x 6ft space. PSVR, Sony’s flagship VR headset, has everything you need when looking for a unique, engaging guest experience. Widely regarded as the most comfortable of the VR headsets, the PSVR was designed with the user in mind. Plus, the image quality, as well as the field of view, are more than capable of immersing you in virtual reality. Using the Playstation’s “Move” controllers, your guest will have a great time as they explore a huge number of possible VR experiences. If you’re interested in learning more about the PSVR, check out our full system breakdown. As you consider renting the PSVR, make sure that you’re getting everything necessary for a full VR experience. That would include: a PSVR headset, two Playstation “Move” controllers, a Playstation photosensor camera, and a computer or laptop capable of running virtual reality experiences. We also suggest including an external monitor that displays the virtual reality experience so that everyone can see what’s happening inside your VR headset. Also, you’ll want to consider your available event space when renting any VR headset, we suggest having an 8ft x 8ft space available, but we can adjust the experience to accommodate smaller spaces when necessary. 360˚ Virtual Reality headsets offer a completely different experience from room scale options. These headsets are more compact and allow you to offer VR to multiple guests at once. Plus, since 360˚ headsets are capable of providing a huge range of VR videos, they offer your guests the ability to easily choose their own favorite VR option, letting them take control of their virtual reality of your event. Wether you want your guests to travel to exotic destinations, experience extreme sports up close, relax while experiencing VR meditation, or anything else, 360˚ VR can make it happen. Below, we’ve included a few different room scale options for you to consider as you think through your VR rental options. The Samsung Gear VR is one of the top options when considering 360˚ headsets. It’s compatibility with Samsung phones means that the video options for the headset are endless. Whatever you need, the Samsung Gear VR can make it happen. Plus, the Gear VR was built with comfort in mind. No matter how many videos your guests want to watch, they’ll never have to worry about the headset becoming uncomfortable due to a lightweight design and adjustable head strap. When you add in the high image quality, the result is an awesome vr experience. As you rent the Samsung Gear VR, make sure to look for these key elements: a Samsung Gear VR headset, high-quality headphones, and a Samsung Galaxy smartphone pre-loaded with VR experiences. Also, if you think this might be the right option for you, check out our Gear VR rental options. The Oculus Go takes everything that's great about the Oculus Rift and fits it into a mobile, user-friendly headset that your guests will love. While you can always borrow from the existing library of existing Oculus games, this headset also offers the expanded ability to quickly access VR video that will keep your guest entertained no matter if your event is for three hours or three days. Made out of a special fabric, the Oculus Go headset was designed to be strong enough to handle as many adjustments as necessary while also maintaining elasticity and comfort. On top of that, this headset is fitted with top-quality lenses that enable a crystal clear view of any VR content. Take a look at our full Oculus Go page for more information! In order to get the complete experience, your Oculus Go rental should include: an Oculus Go headset, headphones, and Oculus Go "nunchuk" controllers. you may also want to pre-load the headset with experiences so that you have more control in directing your guest's VR experience. 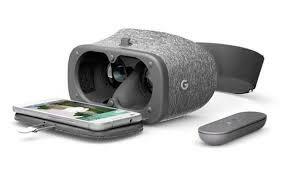 Google's "Daydream" 360˚ headset is a great choice if you're considering renting VR for your next event. With the ability to work with multiple different phone types including those made by Google, Samsung, LG, Motorola and more, this headset gives you some great options for VR content. Whether you want your guests to see what it's like in the deep ocean, have them hike the tallest mountains, or even take a trip through outer space, the Google Daydream Headset can take them there! New content is being created everyday, so feel free to reach out and we'll help you find your perfect 360 VR experience. If you think that the Google Daydream might be the right for you, make sure that your rental includes: a Google Daydream headset, Daydream controller, compatible smartphone pre-loaded with VR experiences, and headphones. Also, we suggest renting more than one headset so that the maximum number of your guests get to experience virtual reality. This can help draw a crowd and start a conversation which can help you reach your event goals. Augmented Reality is exciting because it allows you to interact with virtual objects while also keeping sight of the real world. These headsets are able to place digital, 3D images into your space in a way that completely amazes. Imagine holding a tiny elephant in your palm, watching a dinosaur run through your event space, or even using your own light saber to show off your Jedi training while also getting to see the reactions of everyone coming over to watch. If you want your guest to engage with you or your brand, augmented reality provides a way to keep them talking about your event long after it has ended. The list below includes a couple of our top rated augmented reality headsets. While each bring their own specific strengths to the table, each can be used to deliver a really cool guest experience. The Microsoft Hololens is probably the biggest name in augmented reality at the moment. As one of the first headsets available, it has already been making good on the promise of augmented reality and has produced some eye-opening results. with a high frame rate, the developers of this headset showed an impressive focus on making the augmented reality experience as smooth as possible. With this headset, you'll never have to worry about losing the feeling of complete immersion. Once you try the Hololens, you'll understand why it's an experience you never forget. Check out our dedicated system page to learn more about the Microsoft Hololens. One of the benefits of augmented reality is that you get a full 3d experience without the clutter that comes with extra equipment. With all of the necessary technology located inside of the headset itself, you want to make sure you rent from a trusted VR provider who can double and triple check your equipment and make sure everything is ready to go. Like the Microsoft Hololens, the Meta 2 delivers an augmented reality experience that you have to see to believe. However, the Meta 2 offers an expanded 90 degree field of view that allows you to take advantage of as much of your event space as possible. The headset also contains two top-of-the-line lenses that enable the headset's image resolution to to reach an impressive 2.5k resolution. Some of the notable experiences developed for the Meta 2 include viewing a holographic version of Earth, seeing the inner workings of the human brain, and finding the right combinations to solve augmented reality puzzles. If you're interested in learning more about the Meta 2 headset, we've created a Meta 2 page that covers everything you need to know about renting this augmented reality headset. As more and more augmented reality experiences become available, we're excited to see how we can fit the emerging technology to your specific event needs. The Lenovo VR headset is different from the other augmented reality headsets on this list in that it was designed for one specific experience: Star Wars VR. Used with a special sensor and dedicated light saber, this headset brings the ultimate Star Wars experience to your guests. We can't promise your guests will use their powers for good, but we know that regardless of their choice, all of your event attendees will enjoy this VR experience. If you're looking to rent the Lenovo VR headset, you should make sure that your rental comes included with the Lenovo VR sensor as well as the special light saber controller unique to this experience. To learn more about this headset, check out the dedicated Lenovo VR page. If you're planning on creating unique, branded virtual reality video, then you might consider renting a 360˚ capable camera. With these cameras, you can capture a scene from every angle, and develop content that puts the viewer right in the middle of the action. This a great way to share your vision with your employees as well as those who might not already know about what you do. Having the ability to transport viewers to your office, your field location, your production facility, or simply your favorite location is an extremely powerful tool, and any of the options listed below can help. Below are some of the top options that are currently available for 360˚ video capture. The 360 Fly 4k, with its spherical design and mounting capability, is one of the more popular 360˚ cameras on the market today. Due to being one of the affordable options available, this camera has seen wide use in creating 360˚ content. With a top resolution of 2,880px x 2,880 px, the 360 Fly 4K has the ability to capture quality video no matter where you shoot. It also has a user-friendly mobile app that allows you to monitor and edit the video you capture, which definitely comes in handy. It's filed of view is 360˚ by 240˚ which means you do lose some of the "bottom" of the video you take. However, if that's a problem, you can easily fix by renting two cameras and using a mount that places them back to back. For more information on renting a 360 Fly 4K, you can check out this page that covers rental cost as well as current availability. We look forward to seeing your new 360˚ video! When it comes to capturing high-quality 360˚ video, it's hard to beat the Orah 4i. Housed inside of this model are 4 lenses with 4 separate sensors that combine to allow complete 360˚ capture with ease. Also, because it uses the best available cameras, the Orah 4i is able to video in full 4k resolution. Once you have captured your video, storing the video is easy. You not only have the ability to save video to an SD card, but you also have the ability to preview your content on multiple VR systems as the camera also includes VR compatible software. The Orah 4i is one of your best options when considering the 360˚ camera that's right for you. If you want to see more of what you can accomplish with this awesome equipment, check out this full camera description. The Kodak Pixpro SP360 4K is another great option if you are looking to capture immersive video to impress your guests. Using a handheld grip designed to hold two of these cameras back-to-back, you are able to take full 360˚ video easily. Once you have shot your perfect video, a user friendly desktop editing software ( compatible with Mac or PC) is available to add all of the finishing touches. Additionally, if you want more remote control, you can use the dedicated Kodak Pixpro SP360 4K app that lets you manage your videos on-the-go. By choosing the Kodak Pixpro SP360 4K you're sure to create amazing 360˚ video. we can't wait to see what you create! Virtual reality studios exist to help you create completely unique VR experiences that are specific to your brand. A studio can help you capture 360˚ video, develop a VR app, or even build a new room-scale experience just for you. You may consider using a studio if you are planning a big product launch, presenting at a high-traffic, media-heavy event, or are looking for an experience you plan to re-use many times. While working with a VR studio may be costly, it can also provide an awesome opportunity to engage with your audience . The options listed below each show a different side of what a VR studio can help you accomplish. Vision, a Houston based studio, specializes in creating custom content that helps brands connect more deeply with their audience. They focus on taking a "big picture" view of what you are trying to accomplish while developing an experience that is guaranteed to make you stand out. Vision recently worked with Lexus on a 3D mapping project where they projected an augmented reality video onto a building in Hollywood during the national Earth Night Celebration. They also worked with the city of Houston to deliver a video showcasing area highlights for Superbowl 51. As a recognized leader in innovative campaign production, Vision is a great place to start as you begin searching for the Studio that fits your needs. Based in Dallas, Texas, Groove Jones creates both virtual reality and augmented reality to highlight brands. While virtual reality allows you to see a completely new world take the place of your own, augmented reality adds a new layer to your surroundings while keeping the real world in sight. With the flexibility to offer both types of custom content, studios like Groove Jones assure that you have complete control over how your guests interact with you. Partnering with all major brands of virtual reality headset providers, Groove Jones also offers the ability to customize your experience even further based on each headsets individual strengths. Some of their recent projects include creating football team experience for Under Armour, filming a 360˚ video for Travel Nevada, and building a wayfinding app for American Airlines that helps riders find the fastest path through their airport. SubVRsive is an "XR studio" which means that they produce virtual reality, augmented reality, and 360˚ video content. While they offer all three types of production, their most extensive work seems to come through creating 360˚ video. This type of experience is great because it's more easily accessible to a wider audience than both VR and AR. All types of vr headset are capable of playing 360˚ video. Some of SubVRsive's recent work includes: shooting the first completely 360˚ boxing match for Showtime Boxing, Capturing artist performances at Austin City Limits, Shooting a "La La Land" video for Lionsgate, and developing a virtual field trip for the Galveston Museum in Galveston, TX. SubVRsive has proven that it's fully capable of capturing exciting moments and transforming them into 360˚ experiences that you will be proud to show off. Cubicle Ninjas is more of a one-stop-shop than the other other options listed above. Offering a wide range of services from augmented reality apps to E-learning and inbound marketing, this option may work for you if you are looking to combine 360˚ experiences along with help developing other areas of your business as well. Some of their recent work includes creating a guided meditation VR experience, developing an AR app that allows you to put a filter on the world around you, and building a virtual reality car buying experience that brings the showroom to you. With the ability to approach your company, and your idea, from multiple angles, Cubicle Ninjas is a great choice for anyone looking to create an experience that matches exactly what they are looking for and sets them up to succeed long-term. Finding whats right for you! Your options for virtual reality equipment rental are nearly endless. While we believe this list can help you get started, we know that you still might need some help thinking through your choices. Good News! We can help you with that! No matter if you're looking for virtual reality (360˚ or room-scale), augmented reality, 360˚ cameras, or even a VR studio, we can point you in the right direction. We understand that every event is different, and we want to make sure that your VR guest experience is suited perfectly to your needs. If you think you're ready to start your journey into VR, then we can help you make it happen.